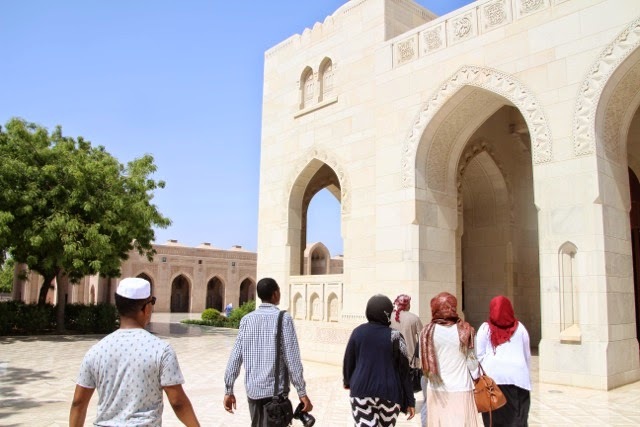 On day seven, we received the biggest dose of Islamic culture. We visited a Omani Mosque. 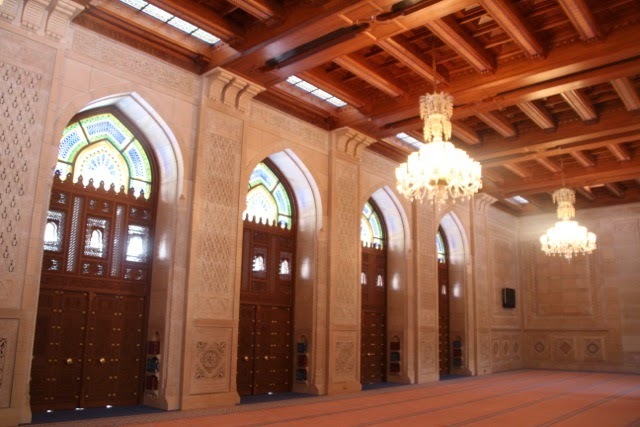 A mosque is a place of worship for followers of Islam. This was a place where we wanted to be the most careful to be considerate of the etiquette in visiting another culture's house of worship. Women were asked to cover their arms down to the wrists, cover their legs with skirts or pants down to the ankles, no exposed hair - which meant that they needed to wear a scarf around their head only revealing their face. Men were asked to have shirts that covered their shoulders and pants to their ankles (no shorts). We could not wear any shirts with any graphics or writing. Music could not be played and voices were to be kept to a minimum. For an idea of what is appropriate attire, I have attached a PDF of Mosque Manners to let you know what was allowed and not. 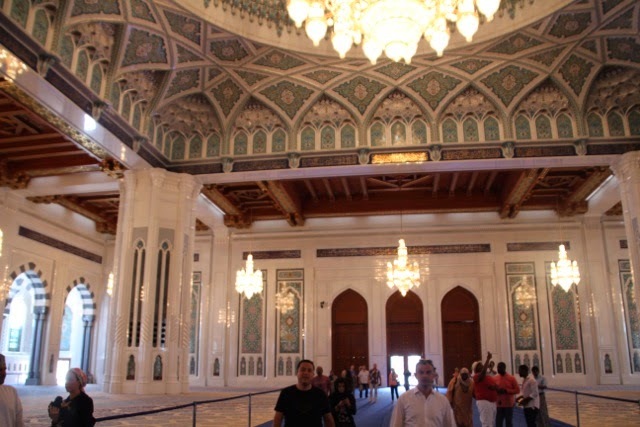 We visited the largest Mosque in Muscat, the Sultan Qaboos Grand Mosque. Construction began in 1995 and was impressively built in only six years, to open in 2001. In Islam culture, worshipers should pray 5 times a day - sunrise, noon, mid-afternoon, sunset, and evening. Men are obliged to pray inside of mosques. For this reason there are many mosques in the country for worship. Women must also pray 5 times a day, however, they are allowed to pray in the home, not necessarily in the mosques. 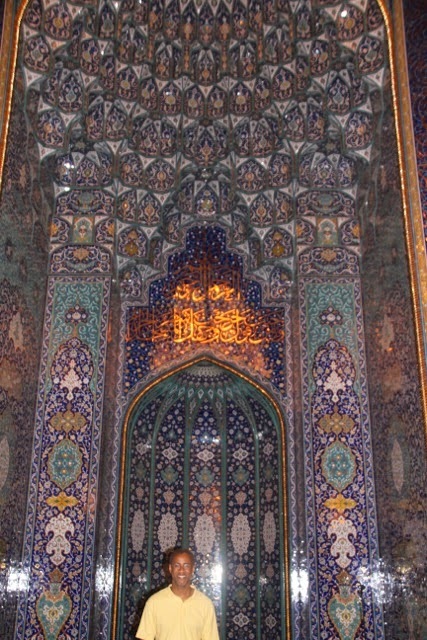 The main altar of the mosque always faces Mecca. Mecca is the birthplace of the Islamic prophet Mohammed and the site of Muhammad's first revelation of the Quoran. We visited both the rooms where the men and women prayed. The men's room was three times as large as the women's room because of their Quoran requirement to actually visit the mosque to pray. 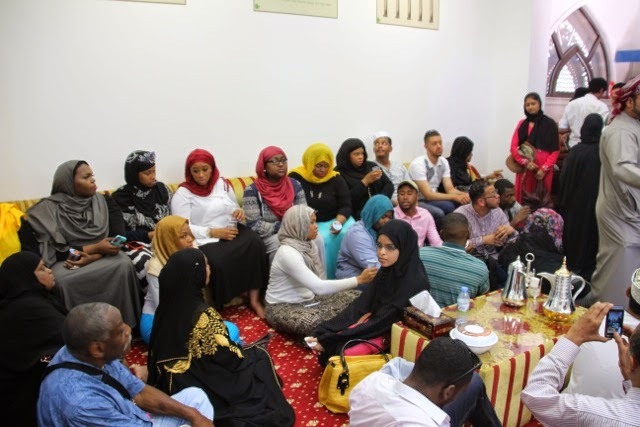 After visiting these rooms, the choir visited a room where we had a lively discussion with sisters of the faith who answered our questions about the nation of Islam. Please see a small mov. file of a video of our dicussion attached. Our tour guides told the students that our students' questions were the best questions ever posed since they had been giving tours - go Morgan students! After the Mosque, we visited the Mutrah Souq - the oldest traditional souq (market) in Muscat, first opened in 1925. We stayed in that area approximately over an hour and half to pick up souvenirs and gifts from Oman. We also had lunch on our own around the souq. 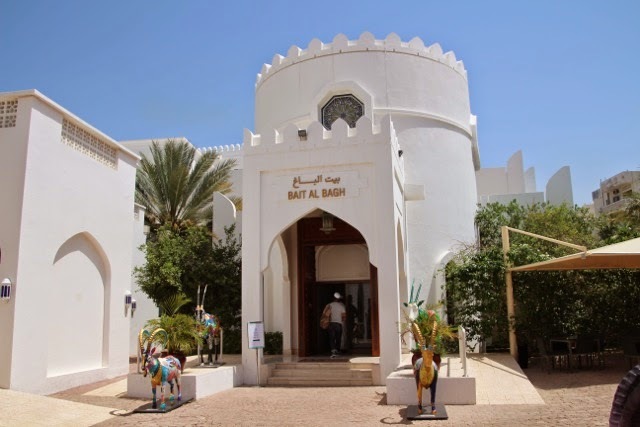 We then traveled to a private museum of Omani culture - Bait Al Zuabair Museum. 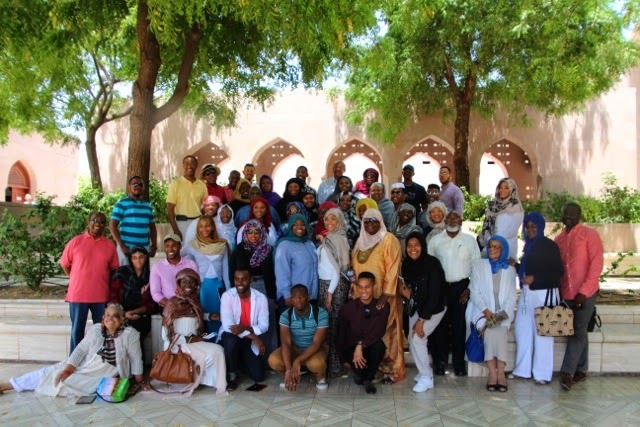 We learned a great deal about Omani culture. Muscat lies in volcanic bowl. When you see the attached photos, notice the mountains that border one side of the city. The rock in the mountains is the hardest rock on this planet - limestone. We learned that Oman is one of the few countries never colonized by a European nation - i.e. the British, Dutch, or Portuguese imperialism. Muscat literally translated means Anchorage as this was an important harbor where many ships sailed. 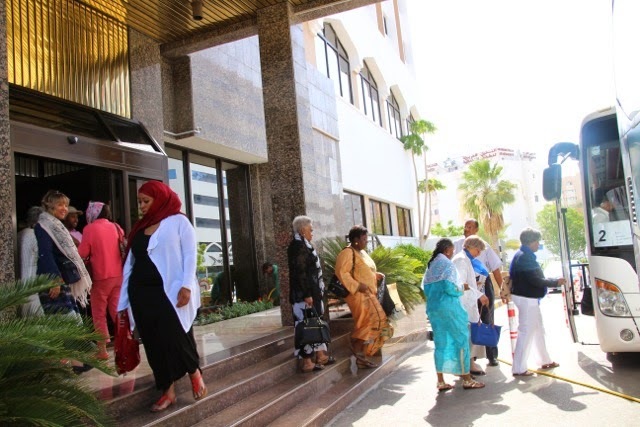 We also learned that if one were to look at the Oman Peninsula, one would see that there are two non-contiguous sections of the country separated by another country. which is very unusual. But much like our non contiguous United States in Alaska and Hawaii, one does not have to go to another country to get to the far region of our country, but can travel via international waters (and of course now by air). Well with Oman similarly, one can travel to non-contiguous areas via sea. Although photos were not encouraged, I did manage to take a photo or two. 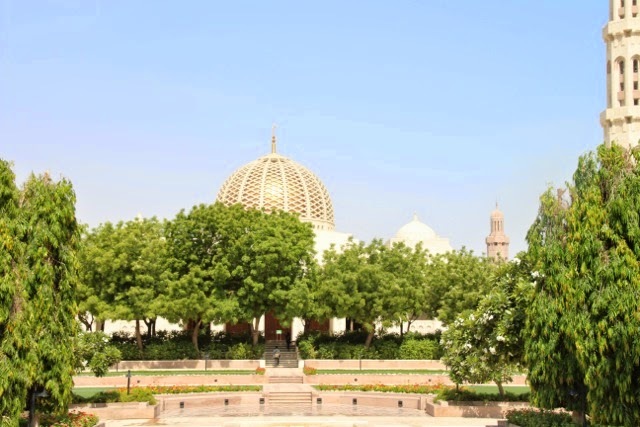 We then visited the Al Alam Palace, the official palace of government of Oman rebuilt in 1972. Although the current Sultan (monarch) lives elsewhere, it still is a very popular place to visit. The palace is flanked by two forts, originally built by the Portuguese. We returned to the hotel for a short break before our evening group dinner. The dinner was at a sports bar named The Rock Bottom Cafe. Again, we enjoyed another buffet meal. After dinner, we stopped by the Royal Opera House of Muscat to take a few photographs. We admirably tried to get a tour, however, the Opera House's schedule did not permit a tour. After our performance for the United States Ambassador to Oman at the Ritz Carlton, Ambassador Holtz was adamant about the the Morgan State University Choir giving a performance at the newly built National Opera House of Muscat (2010 opening). I believe that the wheels are already in motion for this to happen in the coming years! We quickly returned to the hotel to prepare for a early morning departure to drive from Muscat, Oman to Dubai, United Arab Emirates. This will be a seven-hour drive! Although the actual drive is only five hours, we must drive across a huge mountain. So huge, that there must be border control on each side of the mountain, i.e. Omani Customs on one side, and UAE customs on the other. We will have lunch on the way as well. Hello Dubai!